The redness, swelling and pain of the tonsils and the throat are known as tonsillitis. Tonsils are two almond-shaped balls made of tissue that are present at the back of either side of the throat and play a vital role as a part of the body’s immune system for fighting bacterial and viral infections. They contain special cells that can trap viruses and bacteria and stop them from reaching the respiratory tract and other parts of our body. However, sometimes tonsils themselves get infected by the same germs and get inflamed and swollen, which causes discomfort and pain. The white spot that covers the surface indicates infection. This condition is known as tonsillitis. It is not just not sore throat but much more, which leaves the infected person sick and drained. Tonsillitis is highly contagious and can affect anyone; but it is more prevalent amongst school-going children as it can spread through coughing, sneezing and sharing of food, drinks and other items. Though tonsillitis is often treated by doctors using antibiotics, but most often they do not respond. The symptoms usually resolve without medical intervention. However, the condition can improve with self-care at home. There are many natural remedies that can manage the symptoms like runny nose, sore throat, sneezing, coughing, nasal congestion, fever, chills, vomiting and aches and pains in muscles, till the time the body fights the infection. Gargling several times a day using warm salt water is an effective remedy for relieving pain and inflammation caused by tonsillitis. This will help to wash out the pus and fluids accumulated in the throat and kill the germs. Mix 1 tsp salt in a glass of warm water and let it dissolve. Gargle with this water to get relief. There are other natural ingredients that can be used for gargling. Dried leaves of mint or 2 tsp raw onion juice can be used for gargling after mixing in a glass of lukewarm water. Another way to gargle and find relief from the inflamed throat is mixing 1 tsp lemon juice in glass of warm water. You can also use 1 tsp of apple cider vinegar to soothe your throat. 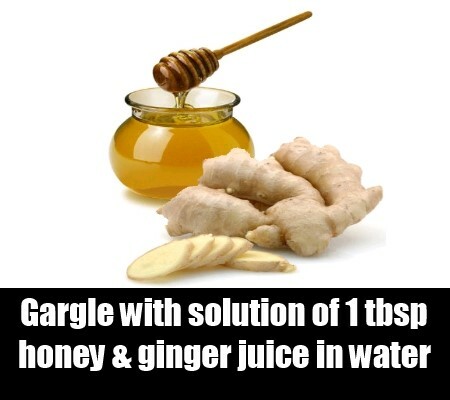 A soothing gargle solution can be prepared using 1 tbsp honey and 1 tsp ginger juice in a glass of warm water. 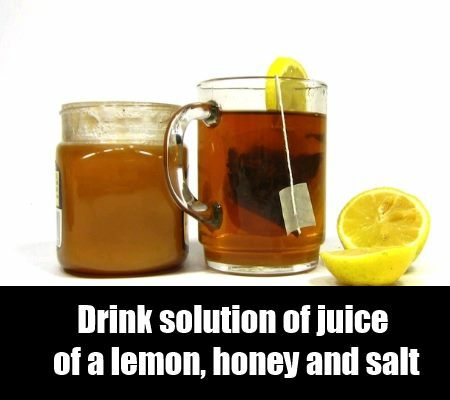 You can sip this solution also to ease tonsil pain. This solution can help to relieve you from congestion also. Some herbal extracts have been found beneficial for getting relief from pain and inflammation of tonsillitis. Sage, tea tree oil, golden seal herbal extract or garlic can be used to make a soothing gargling solution. Inflamed tonsil causes prickly pain when you swallow food. Sipping these drinks can relieve you from pain and make swallowing easy and help fight infection. Here are some natural ingredients which can be used for this purpose. Prepare a drink using the juice of a lemon, 2 tbsps honey and 1/3 spoon of salt. Sipping this drink throughout the day will relieve you from pain and make swallowing easy. A mix juice of carrot, cucumber and beet root in 3:1 ratio can bring relief as it contains vitamins that help to fight off infection. Warm vegetable and chicken soup with a pinch of pepper powder to bring quick relief from tonsillitis and provide energy to recover faster from this ailment. Drink plenty of fluids and water to flush out toxins from the body and heal the infection quickly. Turmeric has antibiotic properties. Adding 1 tsp turmeric powder in a glass of warm milk and drinking at night is a good remedy to soothe the inflamed tonsil glands.